Illumina said today it has acquired Edico Genome for an undisclosed price, in a deal through which the sequencing giant is expanding its offerings to include Edico’s data analysis acceleration solutions for next-generation sequencing (NGS). Edico offers the DRAGEN (Dynamic Read Analysis for GENomics) technology platform, designed to enable a wide range of genomic data analysis, including BCL conversion, mapping, alignment, duplicate marking, and haplotype variant calling. DRAGEN uses field programmable gate array (FPGA) technology in conjunction with proprietary software algorithms to reduce both data footprint and time to results. DRAGEN can be run on premise, in the cloud, or in a hybrid mode, and is flexible and compatible for use with multiple cloud storage solutions and analysis pipelines. “Illumina acquired the DRAGEN Bio-IT Platform to accelerate NGS secondary analysis,” Susan Tousi, senior vice president of product development at Illumina, told Clinical OMICs. “We believe that our acquisition of Edico Genome is a big step toward realizing the vision of reducing sequencing data acquisition and analysis to a push-button standardized process. We foresee making continued improvements to DRAGEN technology, further streamlining and integrating with our sequencing portfolio. Tousi said the DRAGEN platform complements Illumina’s sequencing portfolio, enabling customers to benefit from reduced investment in compute infrastructure and accelerated time to result, improving their overall efficiency and enabling greater emphasis on interpretation and reporting. Illumina will work with Amazon and other cloud storage providers to leverage and enable Edico’s full suite of pipelines on BaseSpace® Sequence Hub. BaseSpace is Illumina’s cloud-based platform designed to extend its instruments for the acquisition and analysis of genomic data, as well as manage sequencing runs and Illumina sequencing platforms. “This integration will provide customers with the flexibility to leverage DRAGEN either locally or in the Cloud for a range of applications associated with our portfolio of sequencers,” Tousi added. Founded in 2013, Edico has established a long string of high-profile partnerships and company collaborations centered on DRAGEN—including with Illumina. Last year, the companies partnered to make DRAGEN available on BaseSpace. And in 2015, DRAGEN was integrated into HudsonAlpha Institute for Biotechnology’s NGS workflow, increasing the throughput of the sequencing facility and eliminating the need for expensive servers. 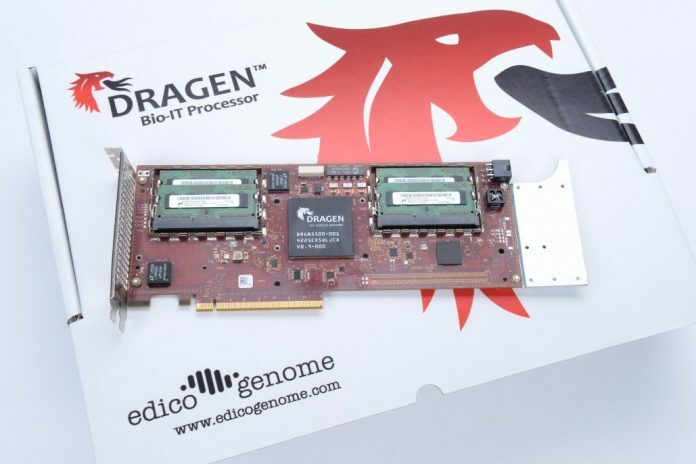 A single DRAGEN processor, Edico said at the time, could analyze the 15,000 human genomes generated by the institute’s HiSeq X Ten sequencing system. One longtime partner of Edico, Rady Children’s Institute for Genomic Medicine, has used DRAGEN Bio-IT and Fabric Genomics’ Opal™ clinical genomic interpretation and reporting platform to deliver diagnoses for critically ill children quickly and accurately in the neonatal intensive care unit (NICU) or pediatric intensive care unit (PICU). Last year, Edico said it would integrate Fabric’s expanded somatic cancer interpretation capabilities for solid tumors, hematology, and liquid biopsy samples into DRAGEN Clinical Genomics Information System (CGIS), designed to enable clinical laboratories of all sizes to develop sequencing-based laboratory developed tests (LDTs) in a manner it said would be quick, simple, and efficient. Late last year, Edico made news when the Children’s Hospital of Philadelphia (CHOP) used the DRAGEN Genome Pipeline to help it set a Guinness World Record for the fastest sequencing of 1,000 human genomes. Earlier this year, for example, Edico agreed to provide analysis of genomic data for Genomics England’s Rare Disease Pilot program, with the goal of diagnosing rare diseases through whole-genome analysis. Previously, Edico forged technology partnerships with WuXi NextCODE, Illumina, and Qiagen, and separately launched a collaboration with Inivata and Thermo Fisher Scientific to assess the quality of collected plasma sample and determine the potential of using liquid biopsies as a tool for improving patient disease assessment and management.